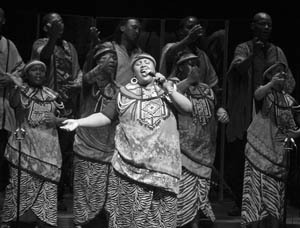 The Grammy-winning Soweto Gospel Choir rocked Campbell Hall. Walking among the noisy, uplifted crowd coming out of Campbell Hall last Wednesday night made one thing very clear: The Soweto Gospel Choir knows how to celebrate. From the first rich and inviting note to the very last gracious bow, the renowned, award-winning South African group of singers, dancers, and musicians reminded everyone present of the pure happiness that can be found in the simple celebration of song. Performing a collection of gospel-inspired numbers in languages ranging from English to Xhosa and Zulu, the choir, whose recent album Blessed was awarded this year’s Grammy for best traditional world music, displayed a stunning variety of voices that lent each piece the unique personality and tone of its soloist. Beginning with a sampling of traditional upbeat melodies that quickly had smiles on the faces of audience members and performers alike, the group moved on to complete a repertoire that not only paid tribute to the hope of South Africa’s democratic future, but also sincerely acknowledged the sorrow of its past. Well-known selections such as “Amazing Grace” and Bob Marley’s “One Love” sounded fresh while retaining their status as time-honored favorites, and African melodies such as the lovely Zulu “Hlohonofatsa” and melodic Sotho “Joko Yahao” were infused with the spirit and culture that was a defining characteristic of the whole show. Yet aside from the overwhelming beauty of the songs-and the voices that brought them so skillfully to life-the excitement of the performance belonged to the enthusiasm and charm of the performers themselves. The drumming and dancing that accompanied many of the more rhythmic numbers was impressive in its athleticism and spirit, and the bright colors and beaming smiles that filled the stage contributed as much to the audience’s enjoyment and sense of admiration as the music. Beyond the pleasure of merely listening, everyone present knew the choir and its music carried a message-one that, in its strength and sincerity, had reached across the cultural divide that separates South Africa from California to relay to our hearts some of the joy, hope, and redeeming power of this heartfelt music.